I know....it's not December...but the kids are back in school and before you know it the holidays will be upon us. If you haven't started your holiday cards yet now is a great time to get started! 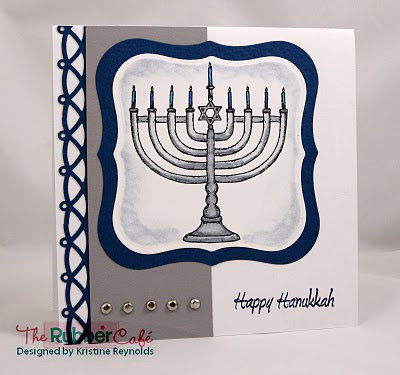 The Rubber Cafe just released a new set of amazing Hanukkah stamps called "Celebrating the Festival of Lights". I am not Jewish but I have a few friends who are and I am so excited to be able to send them cards made "just for them". I've been playing with this new set for a few days and so far this is my favorite card that I've made. I just love this menorah's classic style! I colored it with copic markers. The border punch is Martha Stewarts Quilted border punch but any punch would look great! The edges are distressed with a little chalk to help spotlight the menorah. 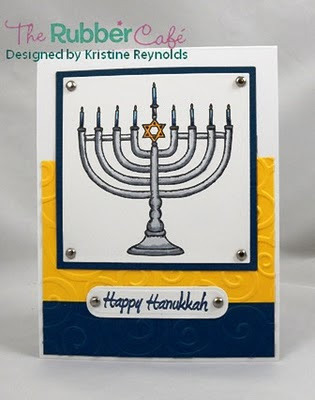 Here's another card I made with this beautiful Menorah. I hope this helps to get your creative juices flowing! You can find these stamps and many other new releases in the store now. great job! love how your cards turned out!